I understand if equipment it not returned or returned broken that I am responsible for repair or replacement expenses. 2.5 gallons (approx. 40 Servings) of freshly brewed hot or ice, coffee or tea, Choose from 4 different daily brews. Comes with 40 cups, sweeteners, stirrers and 1 gallon of whole milk. 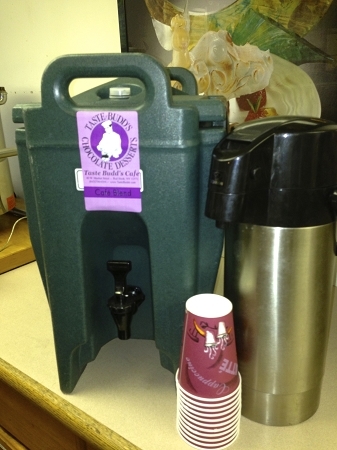 This item requires 1 each 2.5 gallon thermal beverage dispenser and 1 each 1 gallon steel lined air pot. These items must be returned to Taste Budd's Cafe within 24 hours of service or as arranged with management.